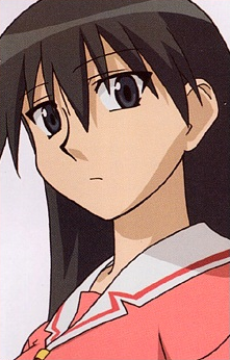 Sakaki is a quiet, stylish girl. Looking cool and distant, she's often seem staring out of the window. Being tall and well-endowed in both athletics and body, she's often admired by many girls in the school where Azumanga Daioh takes place. Despite being tall, cool and aloof or distant, deep in her heart she wishes to be small, soft, and cute, like Chiyo-chan, but she perceives that she can't - because of her height. She loves cats and always attempts to be friendly with them, but often gets scratched and bitten in response. Her soft and girly side shows when she's drawing, talking and reading about cats, or when she's holding one.